For each member of a team who has completed the route within 48 hours. For those who have completed the route within 48 hours but not with the entire team. Awarded to teams whose four members have completed the entire route within 18 hours. Incomplete teams finishing within 18 hours will receive a Team Certificate or an Individual Certificate. Prizes will be awarded to the fastest team in each category (provided they finish the trail within 24 hours as a full team). Any team or organisation which has raised the highest amount of sponsorship (over HK$200,000) in each category. Awarded to teams which have raised HK$100,000 or above. Awarded to the team which has raised the highest amount online. Asia MilesTM Limited, a Logistics Sponsor, has donated 1,000,000 Asia Miles, which will be awarded to 10 teams (100,000 Asia Miles per team or 25,000 Asia Miles per team member).Dah Chong Hong Holdings Limited has donated DCH Foodmart coupons valued at HK$40,000 to be awarded to 10 teams (coupons valued at HK$4,000 per team). Any team which has raised HK$36,000 or above by 17 December 2019 is eligible to enter a lucky draw to win the above prizes. The awarded prize will be evenly shared by the four registered members of each winning team. The right to enter the lucky draw will be forfeited if the team cannot submit all proof of donations to Oxfam Hong Kong on or before 17 December 2019 (according to the postmark). Late submissions, including those who have submitted the sponsorship money or cheques on or before 17 December 2019 but have not sent proof of their donation to Oxfam Hong Kong by the same date, will not be considered for the lucky draw. For details of the awards, please refer to the announcement on the Oxfam Trailwalker website. Only teams which have completed the whole trail on the designated route and in compliance with Oxfam Hong Kong’s instructions are eligible for ranking or prizes. 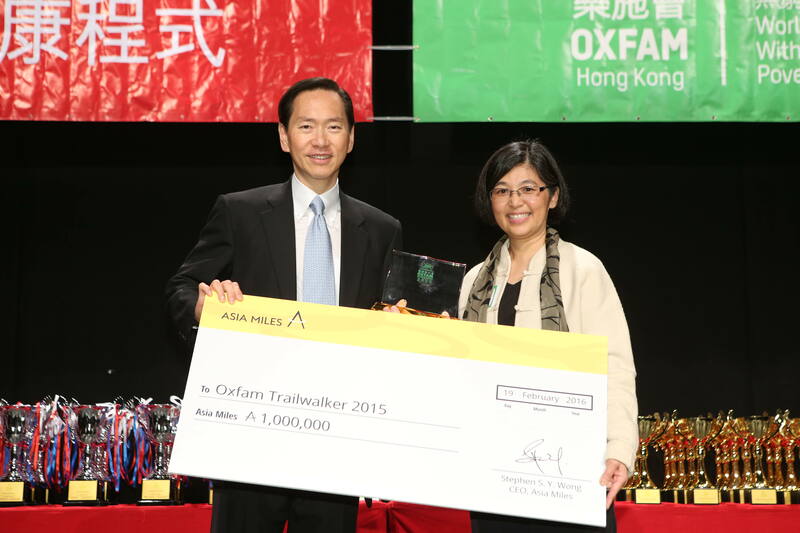 Oxfam Hong Kong will cancel the competition for a particular category if there are fewer than three entities. Oxfam Hong Kong’s decisions regarding the rankings and prizes shall be final and shall not be contested. Oxfam Hong Kong has the right to request all winning teams in the Speed Award and Fundraising Award categories to provide documentation (such as staff cards, corporate sponsorship letters, relevant identification, etc. ), to prove that at least TWO of the team members are eligible for this category. Any team which fails to do so will be disqualified for the award. Certificates will be presented to participants upon arrival at the Finish Point. Please note that there will be a lot of teams arriving at the Finish Point on Saturday, 16 November, so you may need to wait for more than 45 minutes for your certificate. If you would prefer not to wait, please inform our staff at the Information Counter and we will send the certificates to you at a later date by post. The finishing time and ranking announced during the event are subject to verification, and will be announced on the website after the event. Should any team notice any discrepancies on their certificates, please contact Oxfam Hong Kong for clarification and a reprint, if necessary. The winners of various awards will be invited to the Oxfam Trailwalker 2019 Prize Presentation ceremony held in February 2020 (date to be confirmed). On the day of the ceremony, a Thank You Advertisement will be placed in Chinese and English newspapers to acknowledge Oxfam Trailwalker 2019 The names of all fundraising award winners and the teams / organisations raising HK$72,000 or above will also be published.